Home Mindful Eating Mindful Eating: What is it and Why We Need it? Mindful Eating: What is it and Why We Need it? Imagine that you are out for lunch at a restaurant that you love and you order your favourite food. Don’t you delight in the sight of it, the breathtaking aroma, the immediate activation of your salivary glands and then ofcourse the resplendent taste? Food trips to heaven are not uncommon in our lives. And yet, the food trips to heaven end in some sort of hell or the other for us. We are either overstuffed to the point of being sick or stricken with guilt for gorging. Then we vow to abstain, eat less/nothing for dinner, the next morning’s breakfast and the subsequent lunch too until of course we are starving enough to go on an uncontrollable binge again. Our relationship with food is so complex. It does not just entail eating to feed physical hunger it entails eating in a variety of social situations because we are prompted. We eat when stressed, we eat when triggered by boredom, loneliness and when we are at the movies. We think about food in such a distorted manner too. We look at the nutritional information on labels, we count calories when we eat and we abstain from our favourite foods because they make us fat. Then of course is our body image. We tend to see ourselves as fat, bloated and unpleasant looking because we ate a lot at the previous meal, because we put on a pound in the last three days or we just don’t look and feel skinny despite all our efforts. We berate ourselves in front of others, we restrict how we eat and we have a deep inner critic within that tells us we are just not doing it right. So much of our energy goes into everything that surrounds eating and food. And it mostly goes into making us feel disconnected with ourselves and the food that essentially should nourish us and keep us happy. One may not realize this but this very restrictive pattern of eating, and the overeating that follows or the inner critic’s voice that follows us in our days are signs that we are putting our bodies on a diet even though we wouldn’t outwardly admit. Many of us put it out there of course that they are on a diet. However, there is a growing trend and research backing that has clearly demonstrated that diets don’t work. Diets meaning the ones we say we are on and the ones we are not on too. Now, stay with me here: How do you think the science behind nutrition developed? What led people to really understand ideal portion sizes? How can a small bowl of fruit fill you, or two rotis the size of your palm be adequate when you feel so ravenous? My bet is that it began with a certain curiosity about what food does with a mix of interest to learn more about the body and what is good for both the body and mind. I imagine that someone out there began this journey of nutritional science with mindful eating. Only when you can really bring together food that is pleasing to the senses and sit in its presence with wholeness can you eat (upon honouring your hunger) with pleasure a small bowl of fruit or two roti’s the size of your palm to actually feel full. This is impossible to do when you are rushing out to work and have a roti rolled up in your hand at the steering and pushing it down while having an angry conversation with someone on the phone. You will end up stuffing down the roti, finishing that angry conversation and navigating the horrid traffic only to feel raw within from the entire stressful few minutes you had and wondering where that roti went and if you in fact actually ate. Today, while dieticians backed by nutritional science tell you what is right to eat and what is not, it feels more like a strict rule you MUST follow in the face of how wrong it feels to your body. Something indeed is missing. It is that curiosity and interest to really see if what someone out there is saying works for your body and life or not. Intuitive eating rejects the diet mentality. It rejects the aspect of restricting oneself because the mind with all its “should’s” says so. In beginning the journey of mindful eating you start to acknowledge that there is a deeper wisdom within, resting in the body, that can guide you to eat with awareness and trust, to nourish and honor our body, mind and soul. Did you know that while intense eating may feel out of control and unnatural, it is actually a normal response to starving and dieting? Authors Evelyn Tribole and Elyse Resch of Intuitive Eating indicate in their book that what is so often viewed as having “no willpower” or having a character defect is actually a very natural urge of the body to energize and nourish itself. However when we interpret this post-diet eating as having no will power, it slowly erodes trust in ourselves about food, diet after diet. The authors further indicate that dieting or restricting how and what you eat is actually putting your body under starvation. When the body is under starvation, it activates the system that is triggered to awaken when we find ourselves in situations of famine. It is no wonder then that we end up overeating or even eating normally after a diet period we gain back the weight we wanted to lose when we first began dieting. 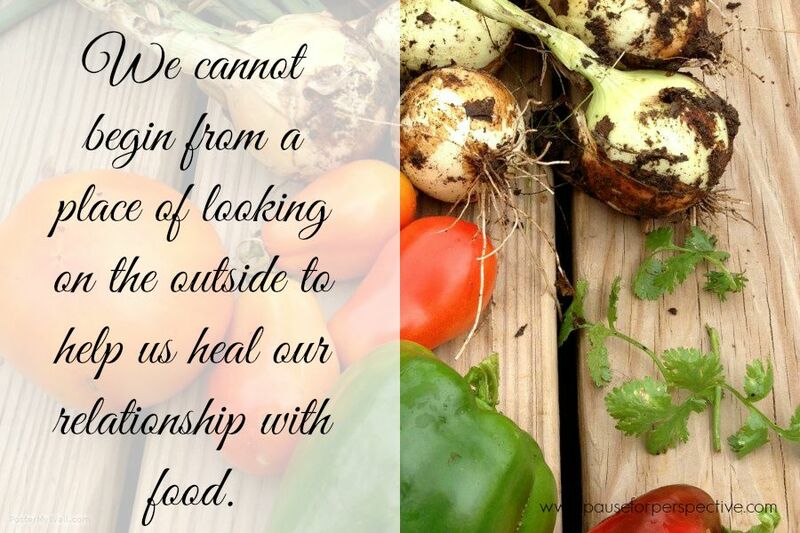 We cannot begin from a place of looking on the outside to help us heal our relationship with food. We need to begin to trust our bodies, and for that we need to gently move our attention to the body and what it wants rather than the mind or the dietician who tells us what we must do. In the next few weeks we will come together in our closed group on Mindful Eating to discover ways in which we can move into the practice of mindful eating. Also, if you are in Hyderabad, don’t miss the two-day mindful eating workshop.My next article will throw some light on diets and what happens to the mind and body when we go on a diet. I will also share with you one exercise that we can begin to practice to help us on this journey of becoming aware of our bodies and what it truly wants in order to nourish and care for itself. In the meanwhile I’d love to hear from you, what has your journey with eating, food and your body been like? What thoughts/feelings come to mind when you read this piece and as you slowly begin to ask your body what it wants, what answers do you receive?